Blend together with a pastry blender or two kitchen knives the flour, sugar salt cinnamon, nutmeg, and butter. Set aside. Peel, core, and slice the apples. Put apples in 10-inch baking dish. Cover with flour mixture. Set baking dish on a baking sheet with sides. Bake 50-55 minutes or until apples are soft and the juices bubbly. Kathy, that’s an extraordinary video, and such a great recipe. What’s great about this video, is that you spend a fair amount of time helping people be safe with kitchen equipment, and that’s really helpful and important. I think most people who are quite advanced in cooking can learn a lot of proper technique from these videos, and while some people have a gift of knowing food very well, they still end up hurting themselves in the kitchen, because they don’t take the time to set up their workspace to do it properly. Thanks for terachng us to be safe while filling our bellies with easy to make treats ! The two knife tip is fantastic. I’ve always tried to crush the butter with a fork… You’ve saved me so much wrist pain… thanks! Okay, Kathy, your timing on this recipe is PERFECT for us — the weather got evil and cold and icy last night, and now all I want to do in the kitchen is cook things in the oven! Your apple-crisp is bubbling in my oven and the fragrance wafting up my stairwell is delightful. I am serving it in stemware with a little whipping cream swirl on the top. I used Granny Smith apples, so they should be nice and tangy with the sweet of the sugar adding to the perfect little dessert. I used brown sugar too. Hubby will have apple crisp to take in his lunch tomorrow. Ross works outside the city and has no close restaurants, so packs a lunch every day. Great recipe, for apple crisp! I love the style of your site, Kathy. The video/snaps really get to the point nicely! Thanks Everyone! BTW, for those that don’t know, David is my husband! He is also my biggest supporter, taste tester, grocery schlepper, camera man, proof reader, advisor, shoulder to cry on, smartest man I have ever met, author, and world famous consultant! I decided the full recipe was too much of a splurge to make for just David and me, so I have adapted the recipe to make just two individual servings. Click here for the recipe! With this version, I mixed the crumb topping with my fingers instead of a pastry blender and it worked beautifully! I’m a single father of two young children. I commute 45 minutes to and from work so when I get home it’s usually a mad rush to get dinner ready. Needless to say I am a fan of the slow cooker. I found your Podcast on iTunes recently and it has brought back my interest in cooking. I never really strayed from the easy stuff because of time. After watching your video podcasts I realized it doesn’t have to take a long time to cook something delicious. The kids LOVE your apple crisp recipe. I ended up with a sticky mess out of the crumble mixture. Not sure why. Tried to add more sugar and flour but it made it worse. It’s in the oven right now and we’ll see what happens? Why did I end up with a sticky mess and how do you fix it? I ended up with a sticky mess out of the supposed to be crumble mixture. I tried adding more sugar and flour, but it only made it worse. I am baking it anyway. Right now it looks like I might have carmel apples :). How do you fix the sticky mess if it happens? Oops! Not good! Did you use real butter? It should also be a room temperature (which technically is about 68F.). Any softer (or melted) and the texture will be all wrong. Wow, this was absolutely delicious. I made it for a valenitnes day dessert. My mom used to make something very similar, but she would bake a butter cookie base, then lay out thin slices of apple and top with what you made, tasted good too but this is so much simpler! That’s great to hear Mike! It sounds like Apple Crisp could become your signature dish! this was my first baked dish..
i found it very easy to make..
and it turned out absolutely fabulous..
Congratulations Salomi! The first of many baked dishes I’m sure! Kathy, you are amazing! The apple crisp looks REALLY REALLY REALLY good. This was so simple to make, with no margin for mistakes, and turned out teriffic! Thank you. Hi Kathy, I was wondering, I personally don’t like apple chunks, is it ok if i puree them? Hi Melissa, I made this recipe last night with Golden Delicious apples. They are not great for baking because they get very mushy when cooked. (It’s all I had in the fridg!) 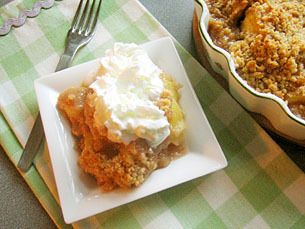 Instead of using a standard baking apple, try making this Apple Crisp with Golden Delicious. You will love it as you end up with no chunks! Thank You Kathy, I have two more question. 1. Can you use those pre- baked crusts for the pie (like the mold thing… i dont know what they are called) instead of haveing no crust? 2. How do I find your podcast? Hi Melissa, you can get my video podcasts by clicking on one of the yellow-orange bars under “Get Our Videos For Free”. This recipe for Apple Crisp is not meant to have a Pie Crust. My Fruit Berry Crisp uses brown sugar. Great to hear your success story! Happy baking! I stumbled across your site and made this apple crisp and it was a huge success! As an avid fan of cooking and baking, I was delighted to see how simple you break things down for those who get intimidated by “thinking outside the cake box” as I call it or those who are not yet at the pro level. Yes, baking is tricky for beginners. Savory dishes are much more forgiving if your measurements are not perfect. Baking is a whole other story! I actually like Apple Crisp better than Apple Pie. In fact I ofter just make Apple Crisp for Two as a special treat for me and my husband! Clear, concise and well illustrated instructions. I especially enjoy the fact that you give us various ways to do the same thing with the advantages and disadvantages of each. Thanks for the recipe and tips. Apple crisp is a classic recipe loved by all. Learn how to make your own apple crisp from scratch with this easy step-by-step video. Baking this delicious dessert has never been so simple!